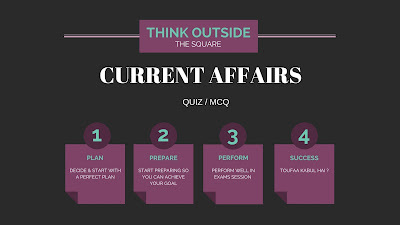 The Daily Current Affairs Quiz - 18th January 2018 question set is very beneficial for your competitive exam preparation as it consists of all important current affairs and news. You must read Daily Current Affairs Update - 18th January 2018 carefully. Q1.Who is appointed as the Chief of Staff of Western Naval Command ? Q2.India has taken part for the first time in a meeting of Shanghai Cooperation Organization under the leadership of _____ . Q3. Which of the following countries has/ have given nod to the BBIN motor Vehicles agreement signed at Thimpu, Bhutan ? Q4.Marta Kostyuk has created history recently by becoming the youngest tennis star to book her place in the third round of Australian Open. She is from ____. Q5.Name the state that has launched a Blockchain Hackathon to see whether the applicant can develop demonstrable prototypes of using the blockchain in Government Applications. Q6.Name the bank that has become the first Indian Bank to cross Rs. 5 Trillion market Capitalization . Q7.Prime Minister of India Narendra Modi and Prime Minister of Israel Benjamin Netanyahu have inaugurated the "iCreate Centre" in _____ to jointly achieve the success through innovation. Q8.Name the Cricketer who has been recently crowned the International Cricket Council's Test Player of the Year . Q9.President Ramnath Kovind has presented the Sangeet Natak Academy's Fellowship and Sangeet Natak Academy Awards for the year 2016 at a function in New Delhi. Who is the present Chairman of Sangeet Natak Academy ? Q10._____ has inaugurated the ____ India International Garment Fair at Pragati Maidan in New Delhi . Explanation 1. Vice Admiral Ajendra Bahadur Singh, AVSM, VSM took over as Chief of Staff, Western Naval Command from Vice Admiral Ravneet Singh, AVSM, NM on 15 January 2018. Vice Admiral AB Singh was the Deputy Commander-in-Chief, Strategic Forces Command prior to his current appointment. Explanation 2. India for the first time took part in a meeting of the international military cooperation departments of the Shanghai Cooperation Organization (SCO) since joining the bloc last year. An Indian delegation led by Major General Ajay Seth participated in the meeting, which discussed issues of practical cooperation among SCO nations. Explanation 3. Bangladesh, India and Nepal have given nod to operating procedures for movement of passenger vehicles in the sub-region under Bangladesh-Bhutan-India-Nepal (BBIN) motor vehicles agreement. Explanation 4. Marta Kostyuk of Ukraine became the youngest player to reach the third round of a Grand Slam in over 20 years following a 6-3 7-5 win over Olivia Rogowska at the Australian Open. Kostyuk only turns 16 in June. Explanation 5. As blockchain - the technology behind cryptocurrencies such as Bitcoin - is fast gaining acceptance worldwide, the Karnataka Government has taken the first step to see if it can be used in some critical areas of governance in the State. Explanation 7. Prime Minister Narendra Modi and his Israeli counterpart Benjamin Netanyahu today attended the inauguration of the iCreate centre in Ahmedabad. Explanation 8. Australia captain Steve Smith has been crowned the International Cricket Council's Test Player of the Year for a second time, while Indian captain Virat Kohli has been honoured twice in the ICC's annual awards. Explanation 9. President Ramnath Kovind has presented the Sangeet Natak Academy's Fellowship and Sangeet Natak Academy Awards for the year 2016 at a function in New Delhi. The present Chairman of Sangeet Natak Academy is Shekhar Sen. Explanation 10. Minister of State for Textiles Ajay Tamta has inaugurated the 60th India International Garment Fair at Pragati Maidan in New Delhi.